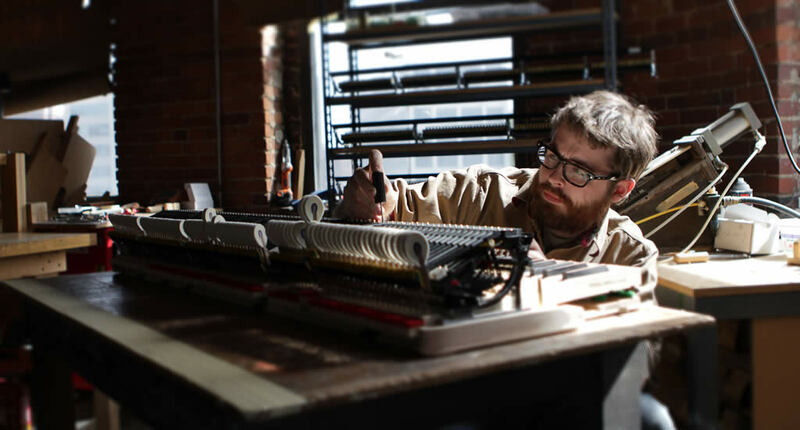 Wessell, Nickel and Gross’ revolutionary piano actions not only minimize maintenance and regulation, but also makes them extremely easy to perform as well. WNG’s piano actions use a specially-developed hard bushing material that is completely impervious to humidity and do not need to be regulated every season. Traditional piano actions use cloth bushings that expand in the summer and contract in the winter, making frequent regulation a must to maintain uniform touch across the piano. WNG uses a synthetic material for its knuckles that has been in the piano industry for over 20 years and is proven to last much longer than traditional buckskin knuckles. Additionally, the synthetic material is inherently slipperier than regular buckskin and will not dry out or become squeaky. Another advantage of WNG’s advanced composite is that the balancier, jack tender, and the top of the jack do not need to be lubricated. Wooden piano actions require a coating of graphite or emralon on these parts to function correctly, however this coating wears off quickly and needs constant reapplication. WNG uses stainless steel springs in all of its repetitions, which are more stable and hold their tension longer than the phosphor-bronze springs found in most traditional actions. Wood, as well as cloth bushings, expands and contracts with the seasons. However, humidity does not affect flange screws inside wooden actions, and when the seasons change, the flange screws become loose. Because WNG uses advanced composite material in its actions that is unaffected by humidity, loose screws aren’t a problem, and never require retightening.